Dive into the essential features in Microsoft Office Access 2007, Excel 2007, Outlook 2007, PowerPoint 2007, and Word 2007. This supremely organized reference is packed with hundreds of timesaving solutions, troubleshooting tips, and workarounds. It’s all muscle and no fluff. Discover how the experts tackle what’s new in your favorite Microsoft Office programs—and challenge yourself to new levels of mastery! Fully searchable eBook—plus bonus chapters! 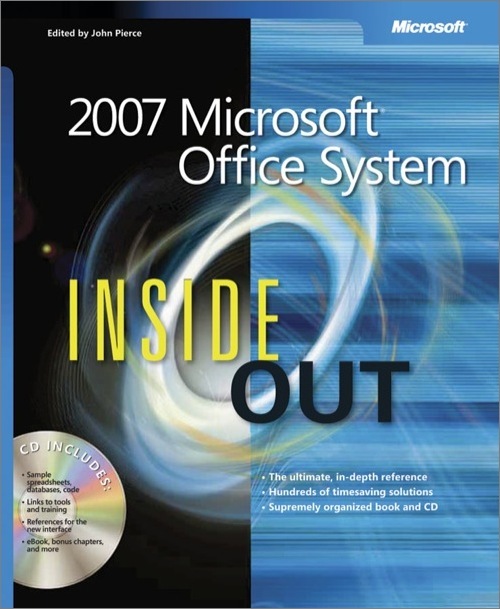 These expert authors, with decades of experience among them, have each contributed essential chapters into this single-volume compilation: Jim Boyce (Outlook 2007), Jeff Conrad (Access 2007), Mark Dodge (Excel 2007), Stephanie Krieger (Advanced Documents), Mary Millhollon and Katherine Murray (Word 2007), S.E. Slack (PowerPoint 2007), Craig Stinson (Excel 2007), and John Viescas (Access 2007). Contributing Editor, John Pierce, is a former writer and editor for Microsoft Corporation. He is the author of Microsoft Office Access 2003 Inside Track and Microsoft Small Business Kit.